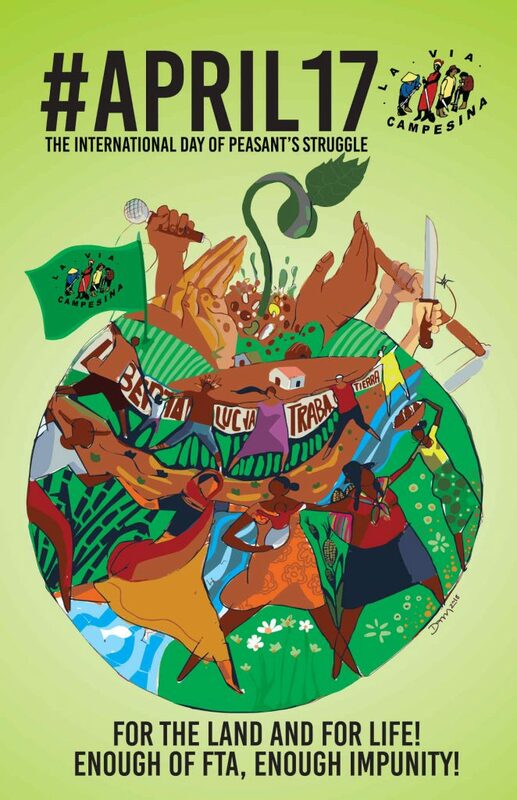 International day of peasants’ struggles 2018 : La Via Campesina calls for the coordination of decentralised, united action ! In this context, Free Trade Agreements (FTAs) serve as instruments propelled by corporations and States to establish the rules by which our natural resources are sold ; they commercialise humanity’s shared resources, such as land and water, and use them to generate profit. Faced with international capital and Free Trade Agreements, at La Via Campesina, we unite to defend and achieve agrarian reform in the sense of the people’s right to land, territory, water and indigenous seeds : the fundamental basis of Food Sovereignty. This 17th April (#17April) we ask you to participate in the numerous actions planned on a global level : organise marches, forums, seminars, rural fairs or film screenings. Every form of expression is important in denouncing the terrible effects of FTAs on the peasantry and on Food Sovereignty. Please share all actions planned for this day by emailing us at : lvcweb@viacampesina.org. We want to create a visual representation of them on our map of global action. Send us your articles, sound recordings, photographs and videos, as well, so that we can broadcast them online and on VíaCampesinaTV. Together, we can feed our people and create a movement to change the world ! Against the looting of resources and imperialism ; supporting the land and sovereignty of our people ! La Via Campesina fights !